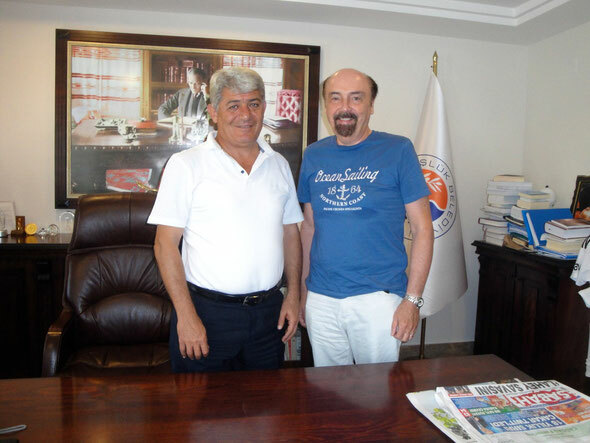 Mayor Mehmet Tire agreed spontaneously to a conversation concerning Gümüslük and the future of this very beautiful place by the Aegean Sea. Close to the people, open and in terms of fact he responded to everything which might be of interest in connenction with Gümüslük in a most pleasant discussion accompanied by a glass of tea. Mehmet Tire won as a candidate of the DP the votes for a Mayor in spring 2009 and since that time one can report a lot of positive facts in the development of Gümüslük. The town hall has been renovated and extended, the place got a new thoroughfare with roundabout traffic. A supermarket was established in the place as well as in the holiday housing estates and the new, modern school was opened. Also a football field with turf belongs to this balance-sheet. A remarkable result! Peter Hofmann: Most honourable Mayor, as I mentioned before, I noticed that a lot of things have been achieved in your municipality and a considerable progress in infrastructure has been made. How is it going to continue? What do you intend during the coming years? Mehmet Tire: First of all the infrastructure must be pushed. A big problem in Gümüslük as well as in the holiday housings is water supply. We have arranged to lay the main pipes for the whole water supply during the last two years and now the necessary joinings to the main water supply are to be expected. This is to be brought about shortly and I hope this to be completed during the next two years. The development of the streets will be consequently continued. ll this must be financed and can only be done step by step. I'm sorry to say that Gümslük is not well equipped financially and if there were not any patrons as we had for the new school building, many things would not be feasable. Shortly we will get a branch bank in Gümüslük and I'm pushing the opening of a patrol station. Peter Hofmann: What are you going to do to make the region of Gümüslük even more attractive for tourists? Mehmet Tire: We are thinking of developing at least one more beach and thus to improve the connection to the sea to find more room for bathing guests in a reasonable scope. This, too, needs money and time. Mehmet Tire: The beach belongs to everybody and is no private property. However deck-chairs and sunshades run into money, so that the owners of a restaurant can al least charge for a drink, if someone sits down there. Nobody can forbid, however, a visitor to settle down there without using these deck-chairs. However, not only the beachis of interest for visitors, but also the mountains offer many a sight and wonderful views on the sea. During the coming years we want to provide foot-paths and in this way make this area accessible for tourists. I also observe to protect nature and envirement and so we also built a purification plant. In this region no waste water gets into the sea. Peter Hofmann: Gümüslük has a big archeological field. Is there a project to make the old Myndos accessible to visitors? Are further excavations to be awaited? 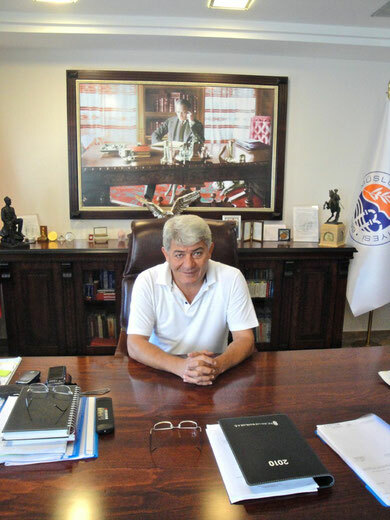 Mehmet Tire: There is a plan, but also a problem. We need the plots of land, for which there exists a building prohibition which makes them uninteresting for the owners. However, the negotations between the owners and the government are difficult. Anyway this will come to an end, the question is only wether this will be possible soon. No doubt, this would be most interesting, as we suppose that the entire antique theatre exists in its basic structure. This is only an example. Peter Hofmann: Rabbit's Isle is fully under control of the excavation technicians and therefore is not any more accessible for visitors who like to wade through the water to the isle. When will this be possible again? Mehmet Tire: This is without influence of the municipality, but of the ministery of culture. At the moment there are measures of conservation anf restoration in progress and everything is exactly surveyed. After that Rabitt's Isle is again accessible for visitors and we'll have a first small archeological park. Peter Hofmann: Which are you especially proud of in Gümüslük? Mehmet Tire: I'm proud to be a native of Gümüslük. 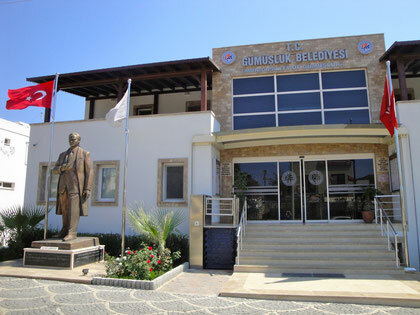 My mother was born in Gümüslük and I'm happy to be able to serve as mayor to this place and to continue to develop it. Peter Hofmann: What makes you uneasy? Mehmet Tire: The financial provision of Gümüslük. The financial means are not enough to handle everything needed. You have to consider that Gümüslük has only 3.700 inhabitants in winter. These are the people who have registered their residence here. In fact there are living at least 25.000 to 30.000 people during summer-time. If only a part of them would register a residence here, this would be a big step forward. According to the number of residents we get not only financial subsidies but also investments of private enterprises as there are bank branches or policlinics are done. Peter Hofmann: This is to say that everybody who is living here for a longer time and not only during holidays should absolutely register residence here? Peter Hofmann: I thank very much for this conversation and wish you health and success!